The content in this article applies to the original Azure Table storage. However, there is now a premium offering for table storage, the Azure Cosmos DB Table API that offers throughput-optimized tables, global distribution, and automatic secondary indexes. There are some feature differences between Table API in Azure Cosmos DB and Azure table storage, to learn more and try out the premium experience, please check out Azure Cosmos DB Table API. Azure Table storage is a service that stores structured NoSQL data in the cloud, providing a key/attribute store with a schemaless design. Because Table storage is schemaless, it's easy to adapt your data as the needs of your application evolve. Access to Table storage data is fast and cost-effective for many types of applications, and is typically lower in cost than traditional SQL for similar volumes of data. You can use Table storage to store flexible datasets like user data for web applications, address books, device information, or other types of metadata your service requires. You can store any number of entities in a table, and a storage account may contain any number of tables, up to the capacity limit of the storage account. You can use Table storage to store and query huge sets of structured, non-relational data, and your tables will scale as demand increases. You can address Azure tables directly using this address with the OData protocol. For more information, see OData.org. Accounts: All access to Azure Storage is done through a storage account. See Azure Storage Scalability and Performance Targets for details about storage account capacity. All access to Azure Cosmos DB is done through a Table API account. See Create a Table API account for details creating a Table API account. Table: A table is a collection of entities. Tables don't enforce a schema on entities, which means a single table can contain entities that have different sets of properties. Entity: An entity is a set of properties, similar to a database row. An entity in Azure Storage can be up to 1MB in size. An entity in Azure Cosmos DB can be up to 2MB in size. Properties: A property is a name-value pair. Each entity can include up to 252 properties to store data. Each entity also has three system properties that specify a partition key, a row key, and a timestamp. Entities with the same partition key can be queried more quickly, and inserted/updated in atomic operations. An entity's row key is its unique identifier within a partition. 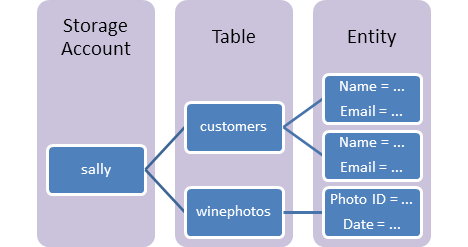 For details about naming tables and properties, see Understanding the Table Service Data Model. Microsoft Azure Storage Explorer is a free, standalone app from Microsoft that enables you to work visually with Azure Storage data on Windows, macOS, and Linux.